This Lent, we're standing with the Pacific. This year for Lent, we're highlighting the huge challenges facing people of the Pacific, and fundraising to support the inspiring work of Pacific churches in addressing violence against women, ending poverty and fighting to save their island homes from climate change. For 40 days, live simply, give up something from daily life, reflect on your faith and act together to support our Pacific neighbours. Join us for Lent Event 2018. Make a donation and help us reach our goal! One of the best things about Lent Event is we do it together. Our Pacific Island neighbours, just like our Indigenous brothers and sisters here in Australia, have much to teach about community and creation. Their traditions remind us of the deep and fragile interconnectedness we all share with the land, water and each other. What affects one people or place inevitably affects another. That's why we don't just encourage you to give, but also to reflect on your own faith journey, your relationships with people and place, and to act personally and together with others to make a real difference. Lent Event is an annual activity of UnitingWorld and the Uniting Church in Australia. Each year during Lent, people give something up, spend time reflecting on their faith and give generously to others. Since Lent Event began, we’ve raised over $3 million together. We've used it to provide life-saving clean water, health and sanitation projects; to build education programs that pull children and familes out of poverty; to train hundreds of Christian leaders for the growing global church; to create peacebuilding programs, and lots more life-changing projects with our partner churches in the Pacific, Asia and Africa. UnitingWorld is the international development and partnerships agency of the Uniting Church in Australia. For more than 50 years we have worked alongside hundreds of communities in Asia, Africa and the Pacific in the areas of health, education, economic empowerment, gender equity, peace and Christian leadership. UnitingWorld is accredited with the Australian government's Department of Foreign Affairs and Trade (DFAT) and we are a proud partner in the Australian Aid program. We are a full member of the Australian Council for International Development (ACFID), and as signatory to the ACFID Code of Conduct we are required to meet the highest standards of corporate governance, public accountability and financial management. Read more about our memberships and accreditation. We work hard to ensure all donations are used efficiently, effectively and targeted to make the most impact in people's lives. In order to run an organisation and use funds effectively and with full accountability, there are unavoidable administrative overheads. For the UnitingWorld Relief and Development Unit, these account for around 7% of our total expenditure. UnitingWorld's full finances can be found in our Annual Report. All UnitingWorld partners and staff have a shared commitment to safeguarding children and taking concrete measures to prevent misconduct. All staff must be signatories to the Code of Conduct, and are held accountable for upholding and promoting the highest ethical and professional standards in their work. We love their great looking, easy-to-use platform, and as a social enterprise seeking to change the world - we have shared interests! Want to do it offline? You can also sign up via the Lent Event website. We'll post you out a sticker where you can collect your savings and send it in when you're done! Have a friend who's interested in ending poverty? Or advancing gender equity? Or fighting climate change? Help us reach our goal by letting them know about Lent Event! 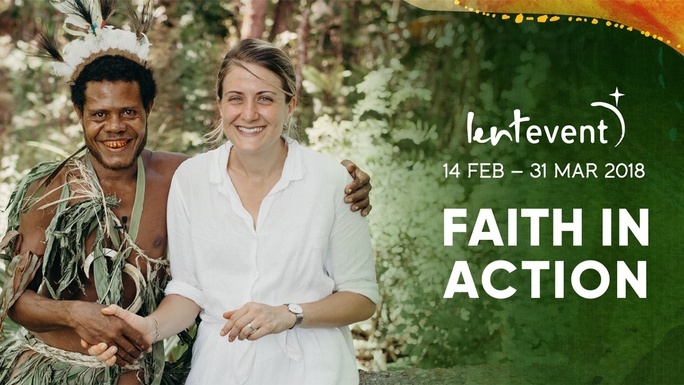 Put your faith into action this Lent to champion rights for women, overcome poverty and stand with our Pacific neighbours in their fight to save their island homes. This fundraiser is part of the "Lent Event 2018: Faith in Action" campaign. Together with other fundraisers, they've raised $525 so far!